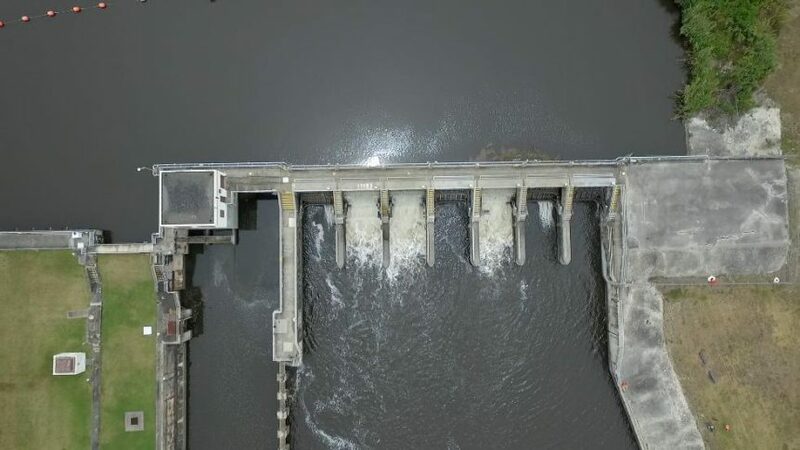 Water started to be released southwest from Lake Okeechobee on Tuesday morning, as the U.S. Army Corps of Engineers seeks to stem a post-hurricane rise in the lake’s water level. The Army Corps had resumed flows from the lake east toward the St. Lucie Estuary on Friday but held off on western releases because of flooding from Hurricane Irma that has slowed storm recovery in Southwest Florida. Power remained out Tuesday for about 2 percent of homes and businesses in Florida after Irma. However, the outage numbers stood at 29 percent in Hendry and Highland counties, 20 percent in Collier County and 10 percent in Lee County, all on the west side of the lake. Water releases stem, at least in part, from concerns about the Herbert Hoover Dike, a 143-mile earthen berm that surrounds the lake. The risk of failure for the dike occurs when the water level reaches 18 feet or higher, and projected inflows on Friday had the lake level soon reaching around 17 feet. The lake stood at 14.83 feet on Friday and had increased to 15.5 feet on Monday, as water rushes in from the Kissimmee River to the north and from agricultural lands south of the lake. State lawmakers this year approved an $800 million plan spearheaded by Senate President Joe Negron, R-Stuart, to start work on a reservoir south of the lake. The Senate plan — which depends on federal matching funds — allows Florida to bond the money as a way to speed construction. By moving water south from the lake to a reservoir, the plan is intended to help clean South Florida waterways and potentially reduce the recurrence of toxic algae outbreaks that have impacted Negron’s Treasure Coast district in past years. Treasure Coast residents blame polluted water releases from Lake Okeechobee for the algae outbreaks. Irma made landfall Sept. 10 in the Florida Keys and Collier County before traveling up the state Sept. 11. On Sept. 12, the Army Corps declared the Herbert Hoover Dike safe. At the time, the dike was 14.55 feet. Before the storm, Gov. Rick Scott ordered the mandatory evacuation of seven communities south of the lake, due to fears that wind from the hurricane could push water over the berm.